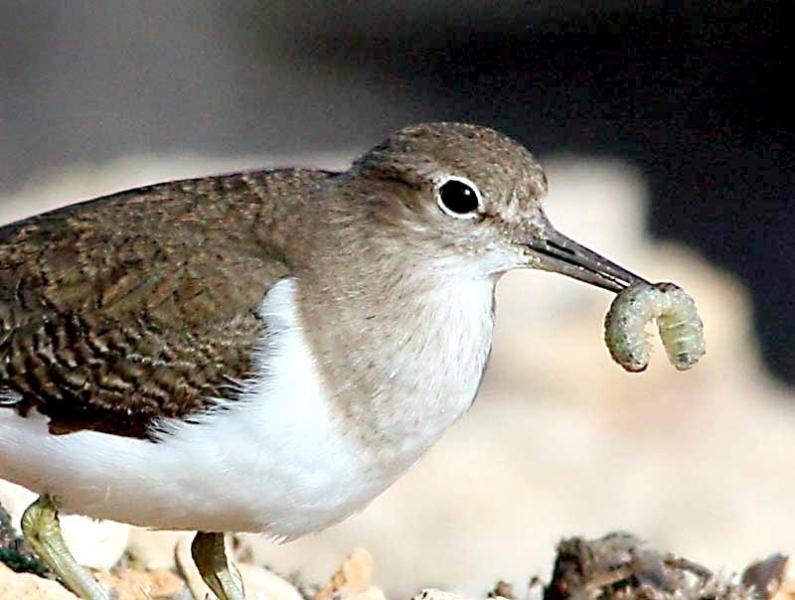 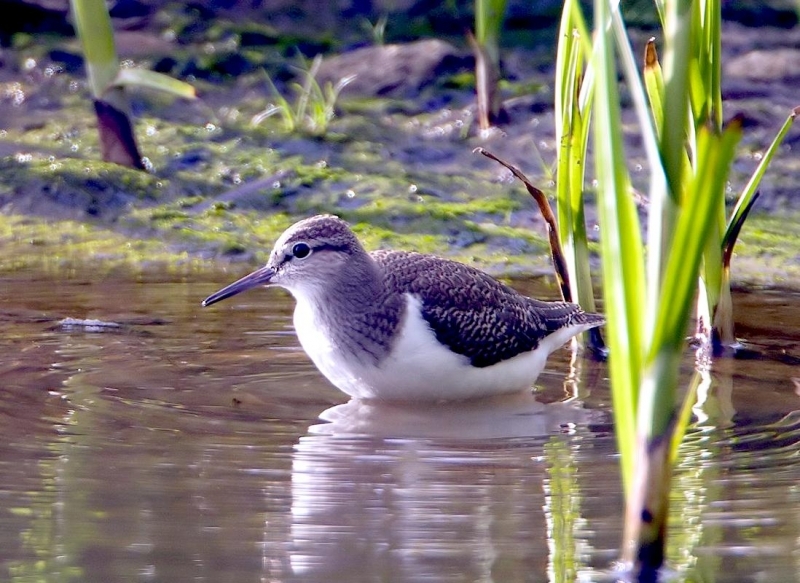 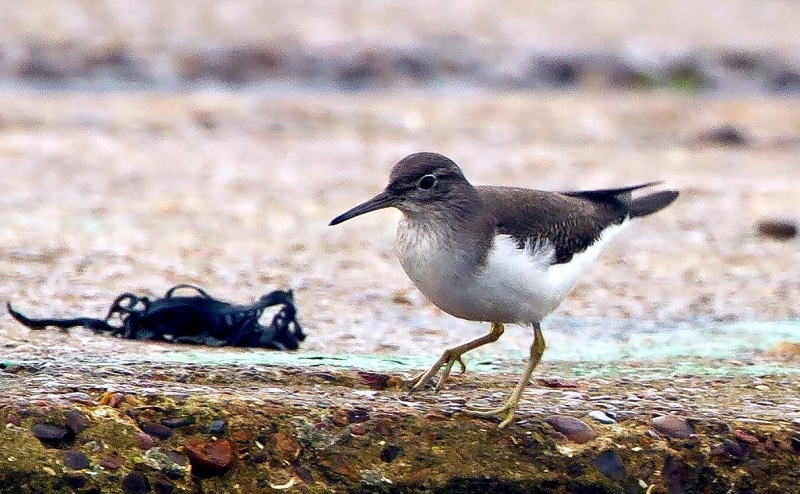 The Common Sandpiper has a varied diet, feeding on a range of insects, spiders, mollusks, crustaceans and annelid worms as well as occasionally taking tadpoles, adult frogs and toads, small fish and some plant material such as seeds. 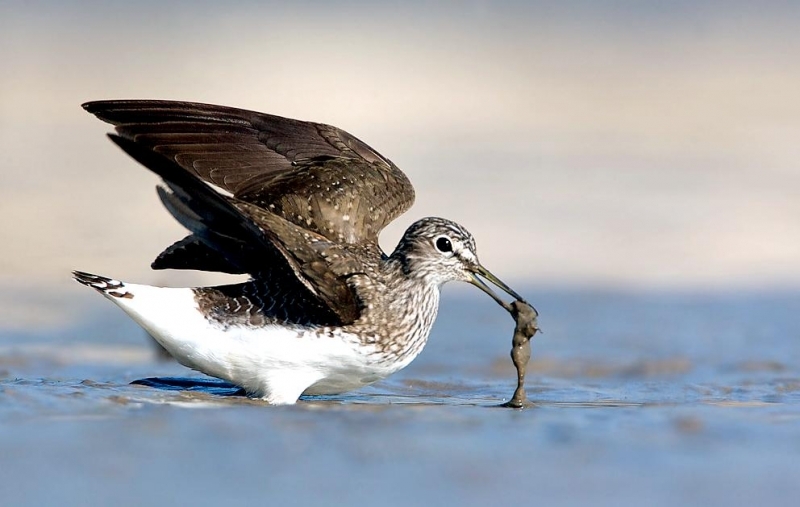 However, studies have shown the winter diet in some areas to comprise mainly marine invertebrates and not many insects. 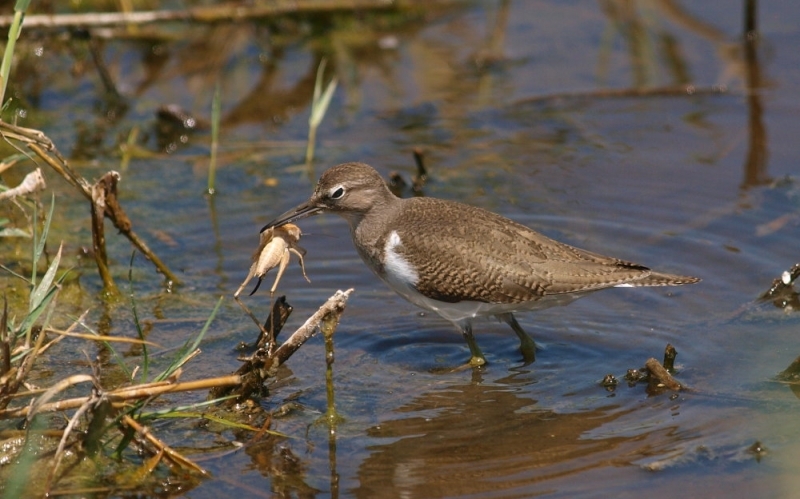 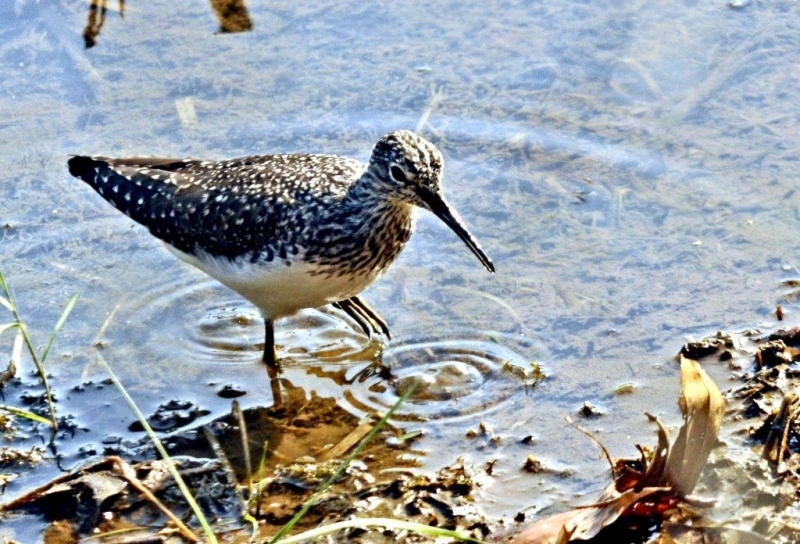 The Common Sandpiper usually forages during the day, alone or sometimes in small groups, with prey commonly taken from the surface, rather than by probing into mud. 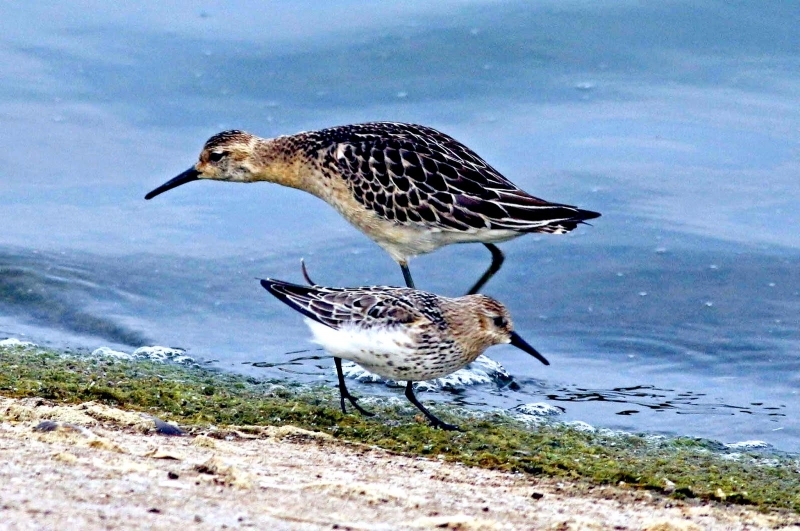 At night, groups of over 100 individuals may come together to roost. 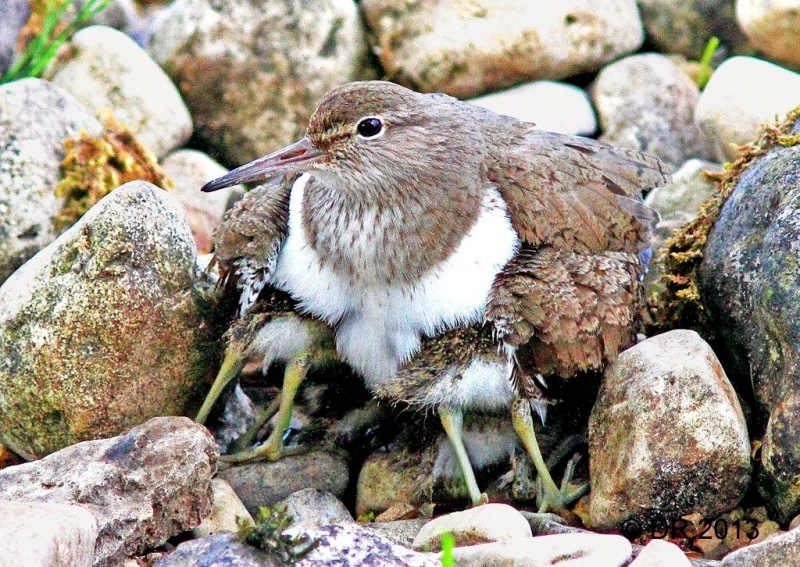 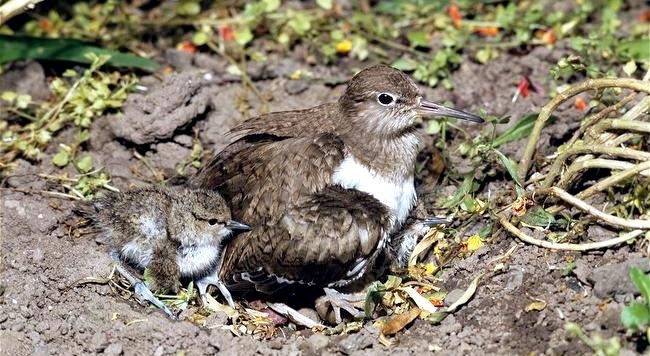 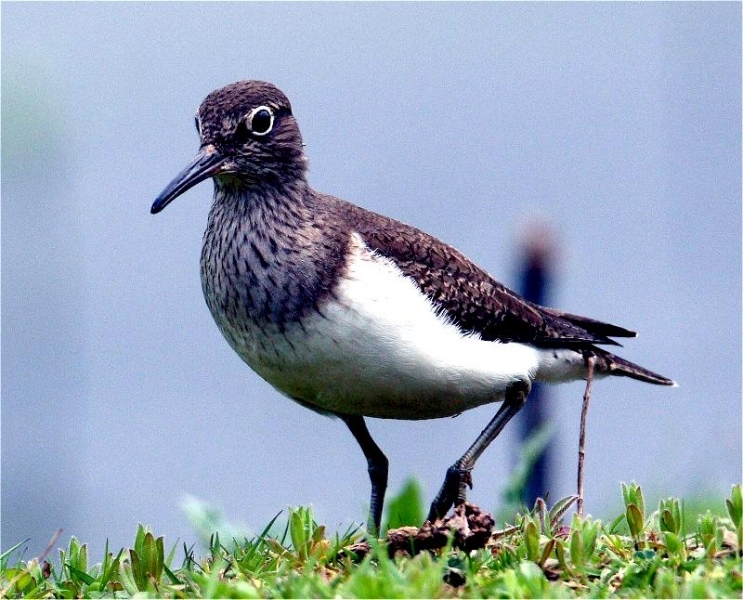 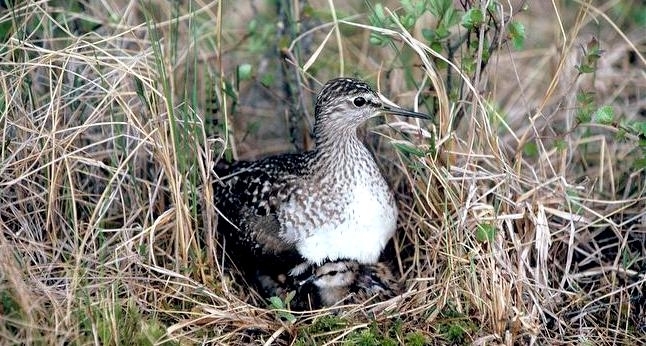 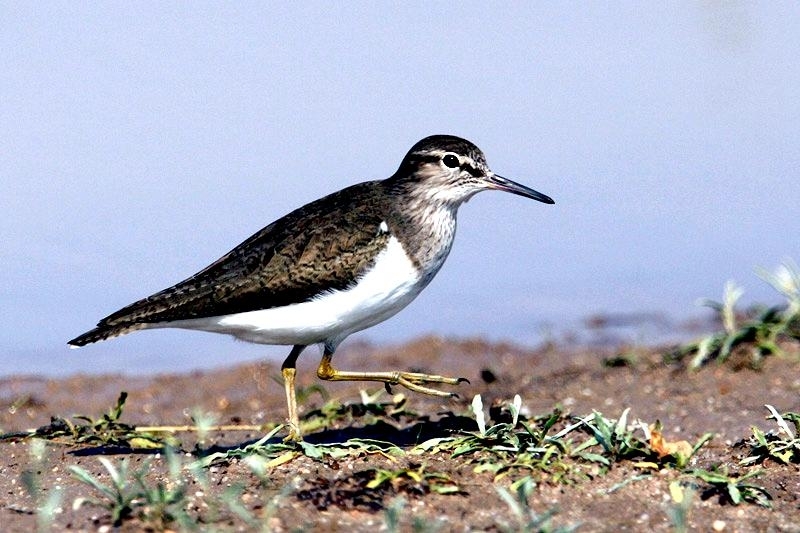 A monogamous species, the Common Sandpiper breeds between May and June, nesting in scattered single pairs. 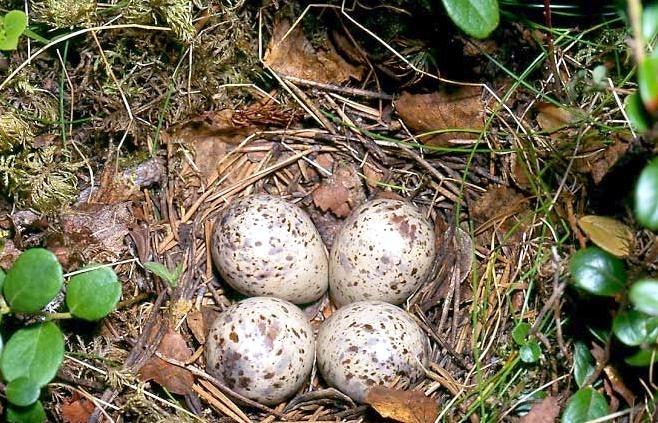 The nest is a shallow depression in the ground sometimes situated among shrubs and trees, into which 3 to 5 eggs are laid. 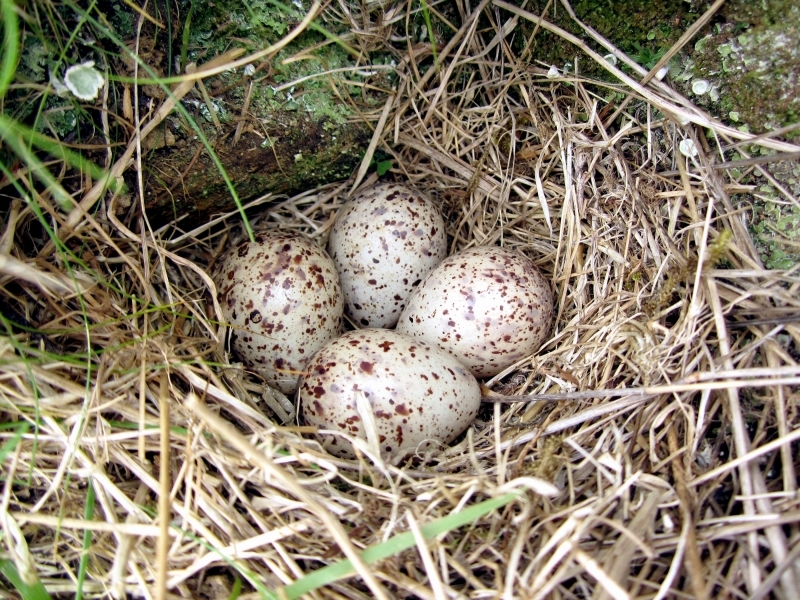 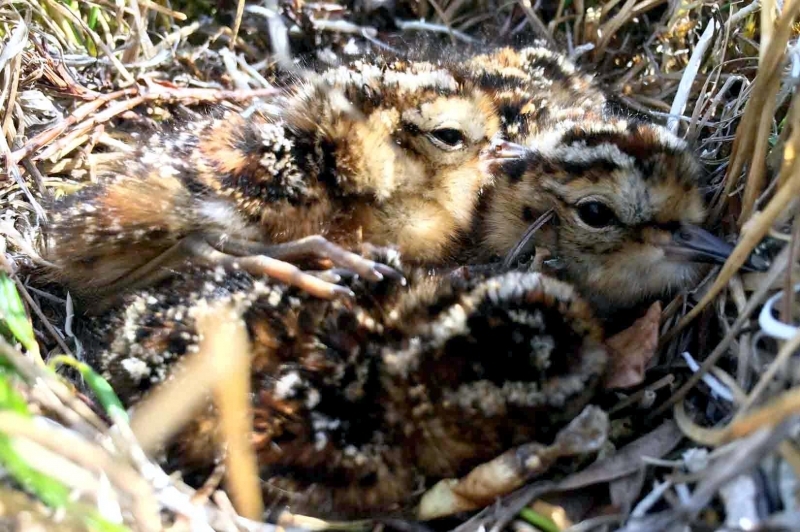 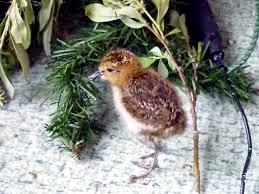 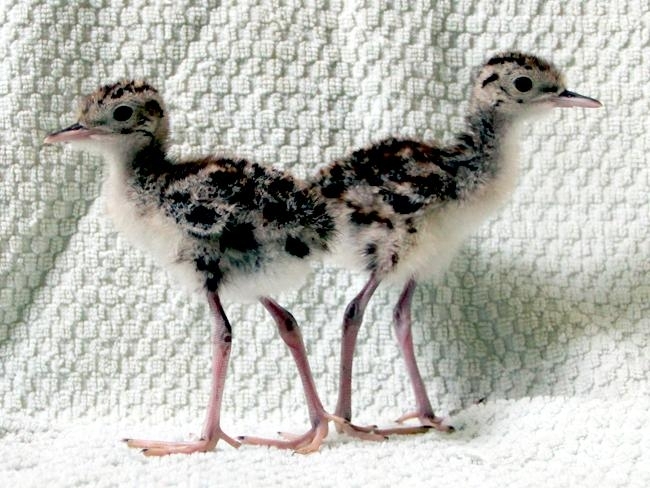 The clutch is incubated by both the male and female, hatching after 21 to 22 days. 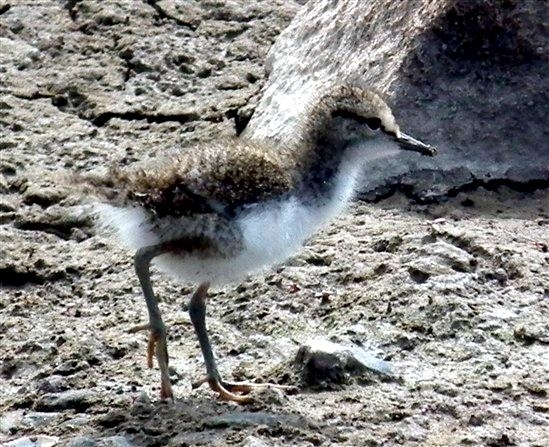 The chicks are grayish-brown, with faint dark speckling on the back and are tended by both adults although one adult often the female, usually leaves before the young fledge at 22 to 28 days. 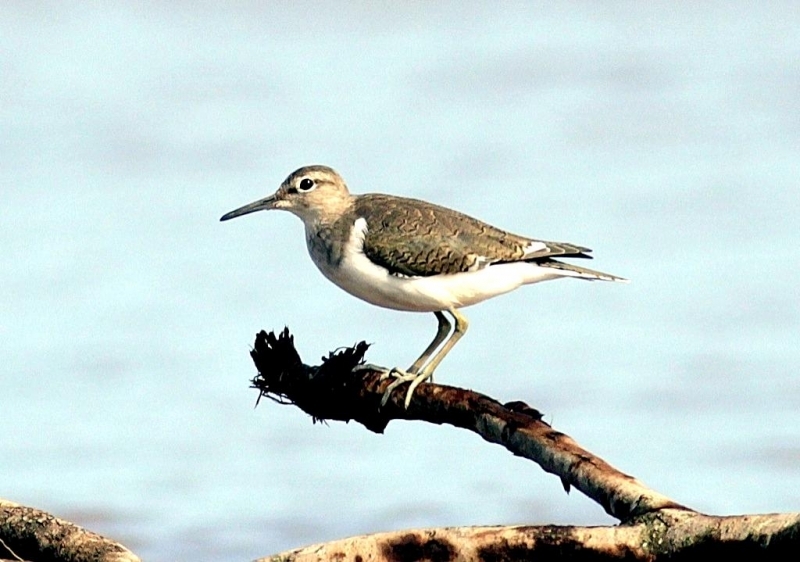 The Common Sandpiper migrates at night, either singly or in small flocks with immature birds leaving the breeding grounds later than the adults and often remaining on the wintering grounds during the first summer of life. 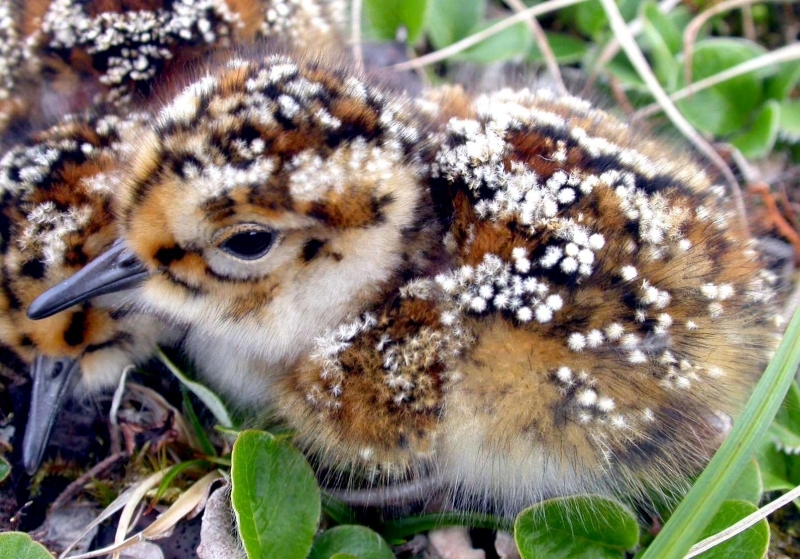 This species has been recorded living for up to 12 years in the wild. 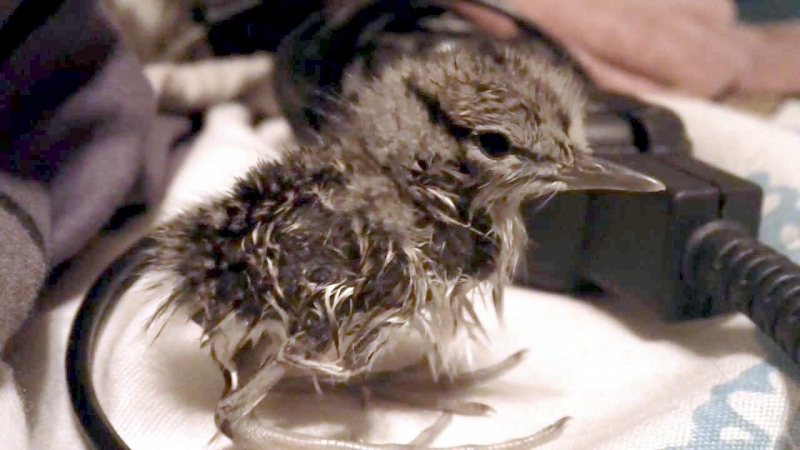 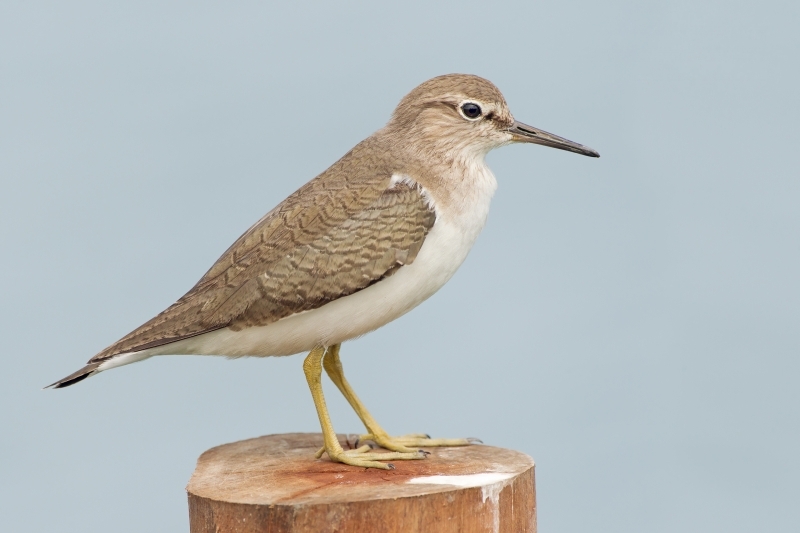 The Common Sandpiper is a rather small, short-legged wader with a long, straight beak, relatively drab coloration and a distinctive ‘teetering’ behavior in which the head and the rear of the body are constantly bobbed up and down when the bird is standing or walking. 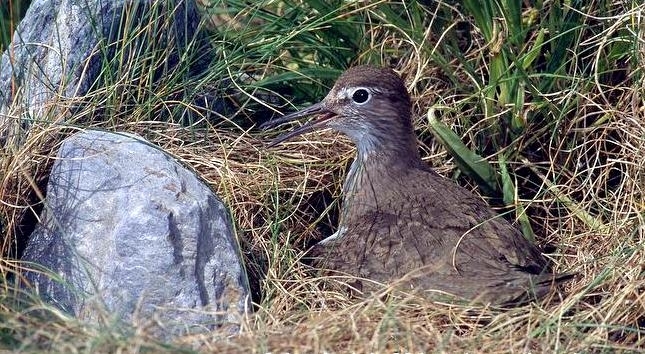 The head, upper breast and upper-parts are greenish-brown with delicate dark streaking, contrasting with the white underparts. 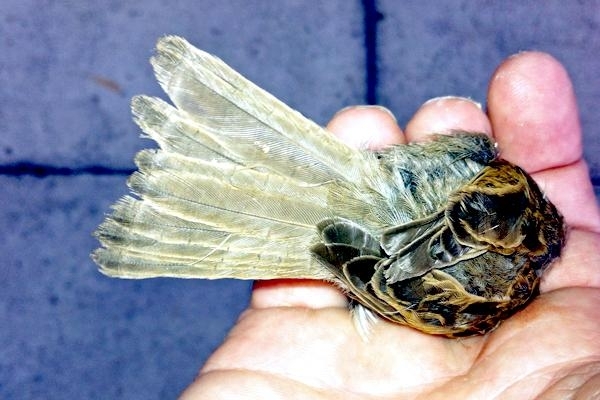 A white eye-ring is visible up close and the legs are greenish-gray. 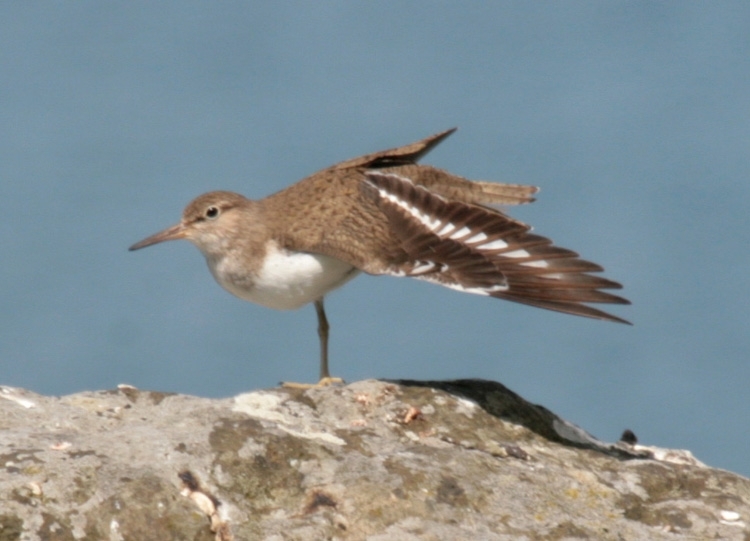 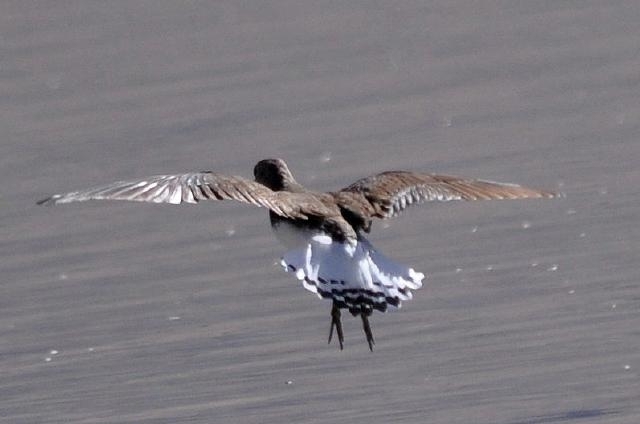 The Common Sandpiper has a distinctive flight, with rapid, shallow wing beats on stiff, curved wings and in flight a striking white wing-bar is visible. 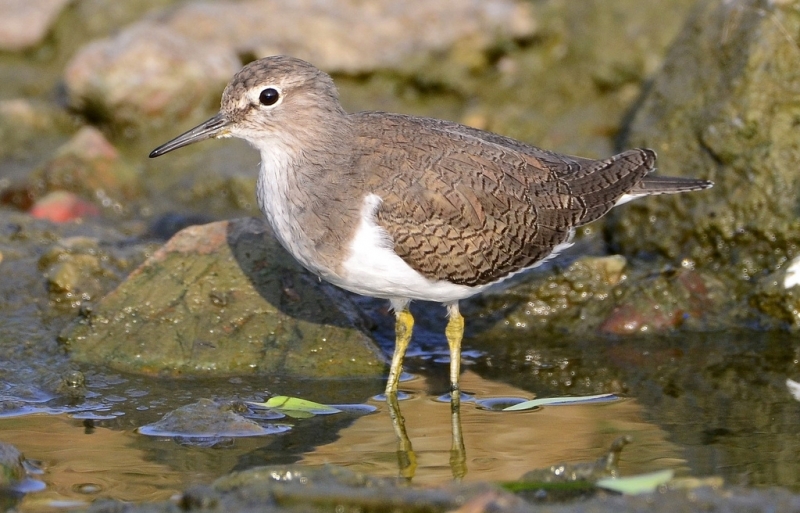 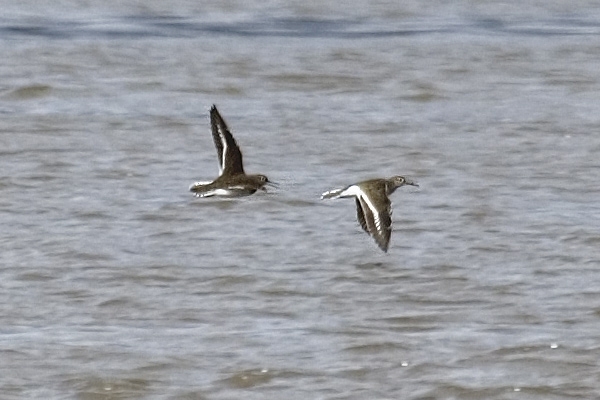 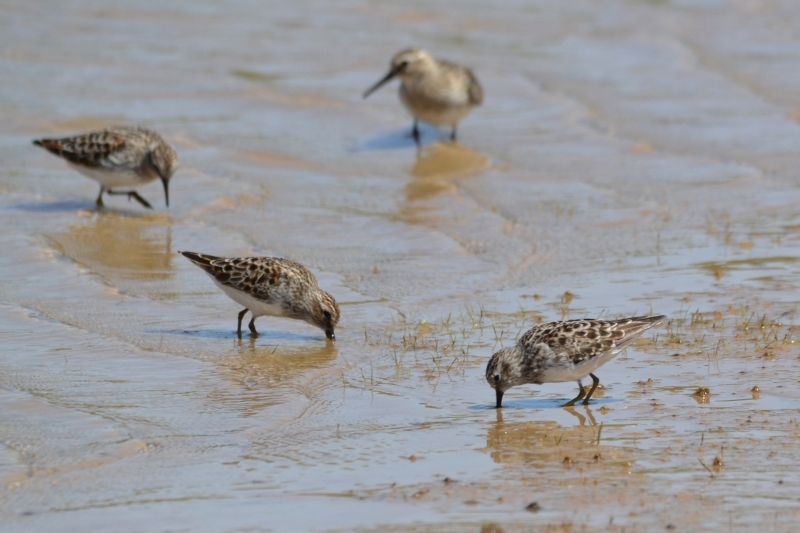 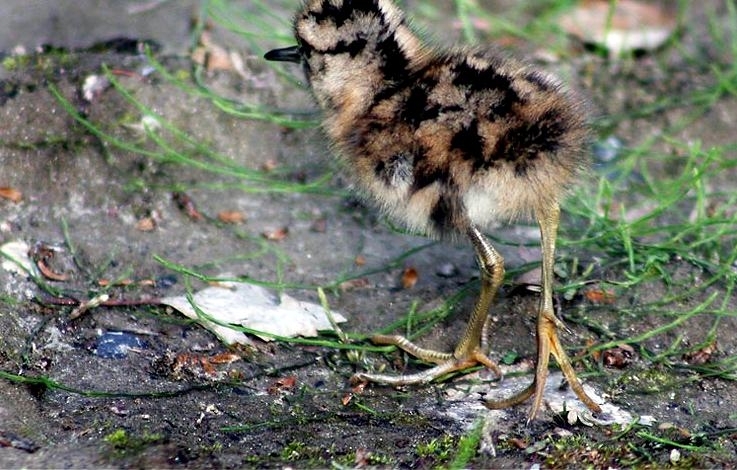 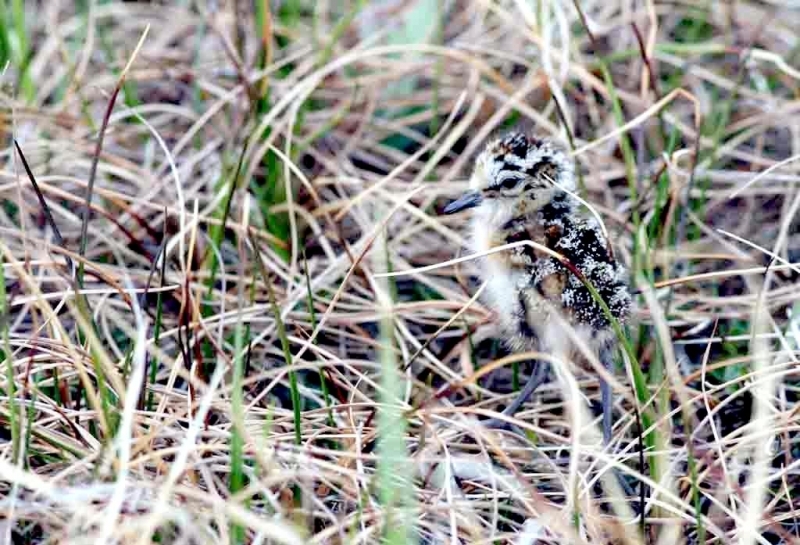 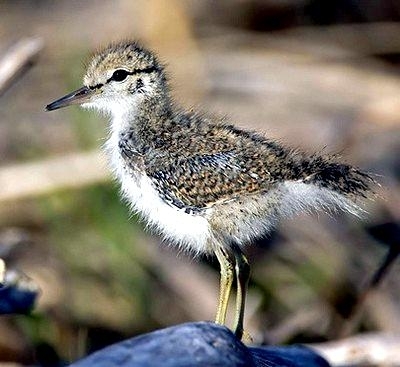 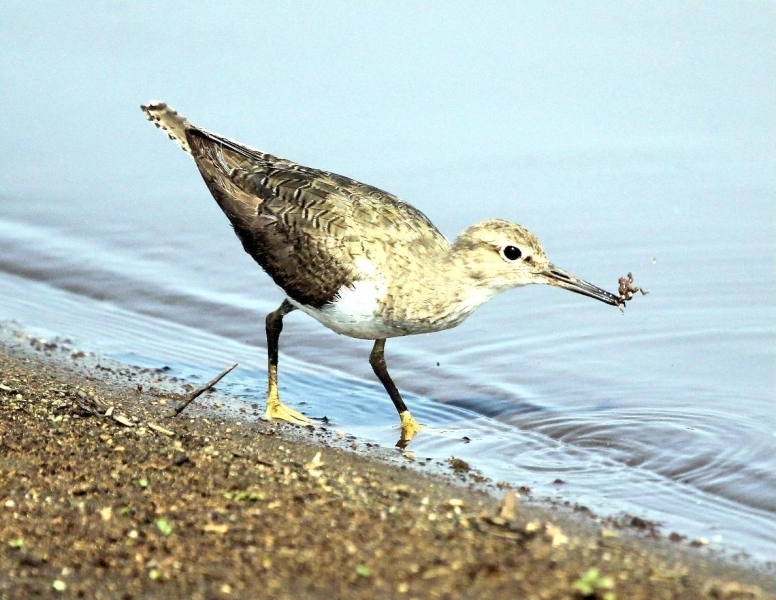 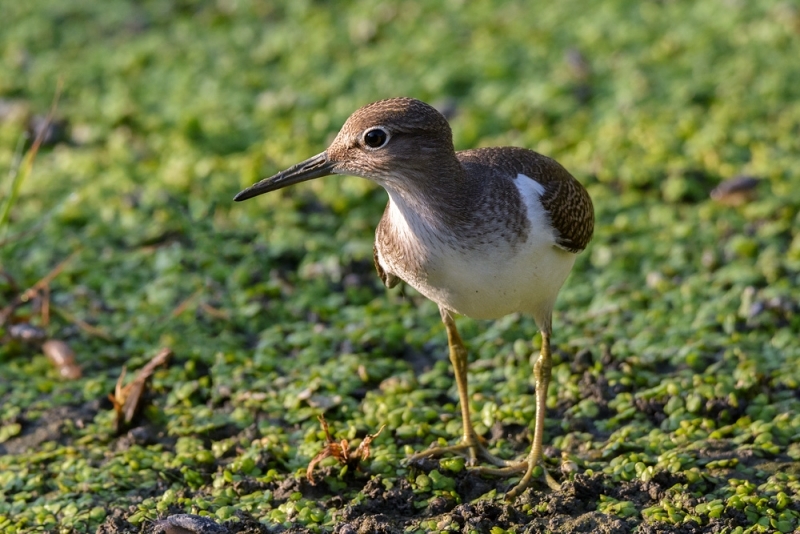 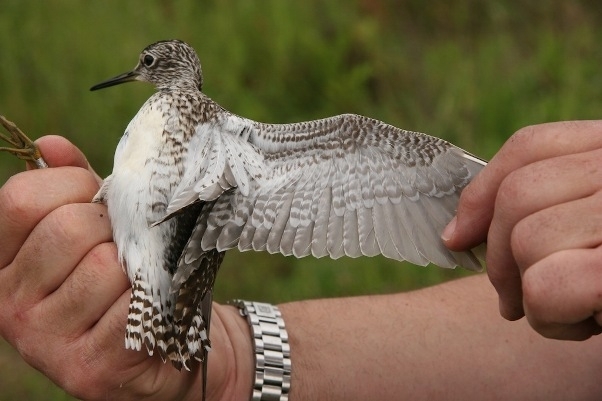 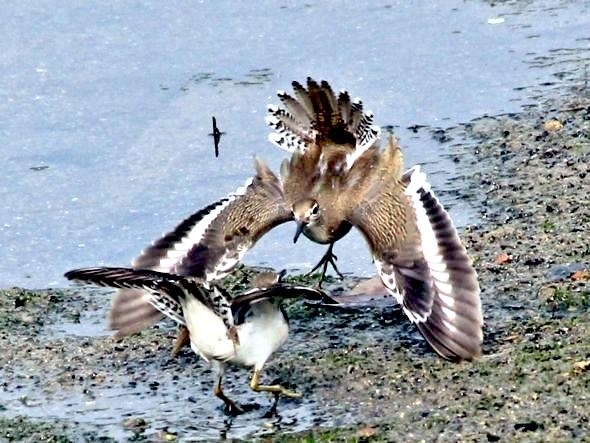 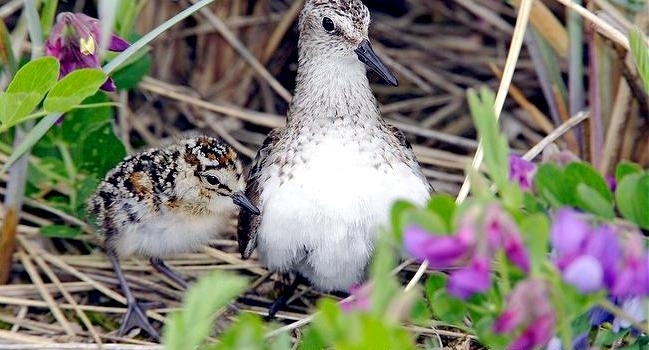 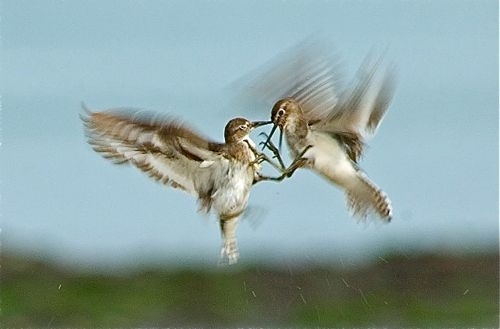 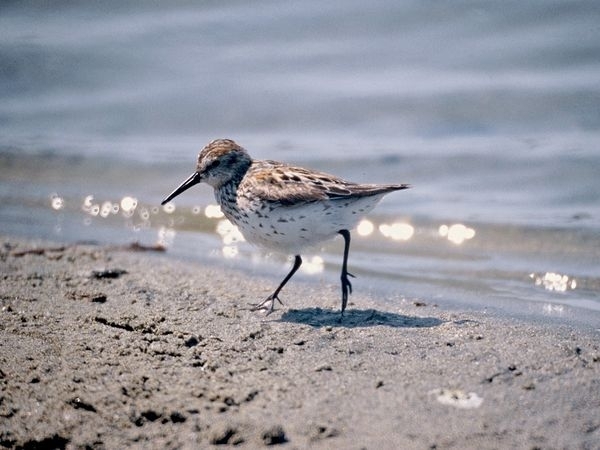 Outside of the breeding season, Common Sandpipers are duller in color, with faintly barred olive-brown upper-parts and less streaking on the head, while juveniles resemble the non-breeding adult, but have more heavy buff barring on the upper-parts. 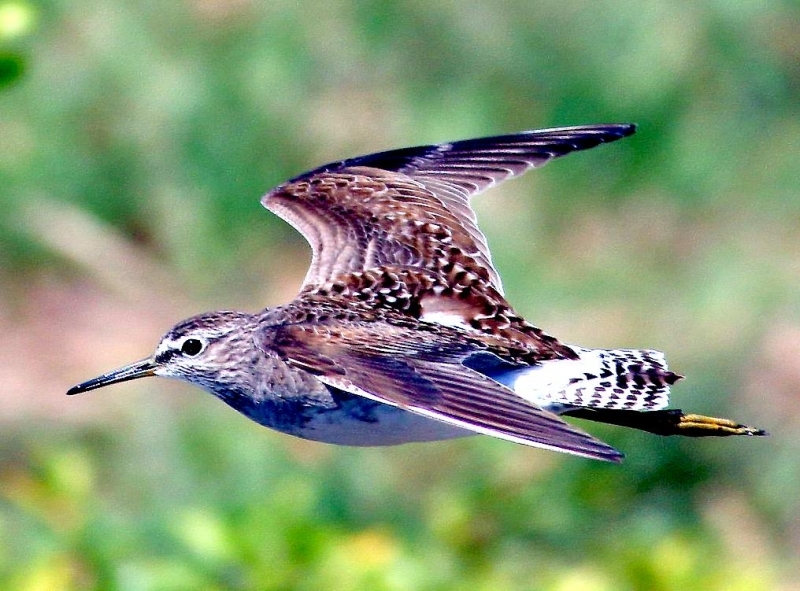 Female Common Sandpipers average slightly larger than the males with a longer tail, slightly longer, straighter beak, darker legs and a more obvious wing-bar in flight. 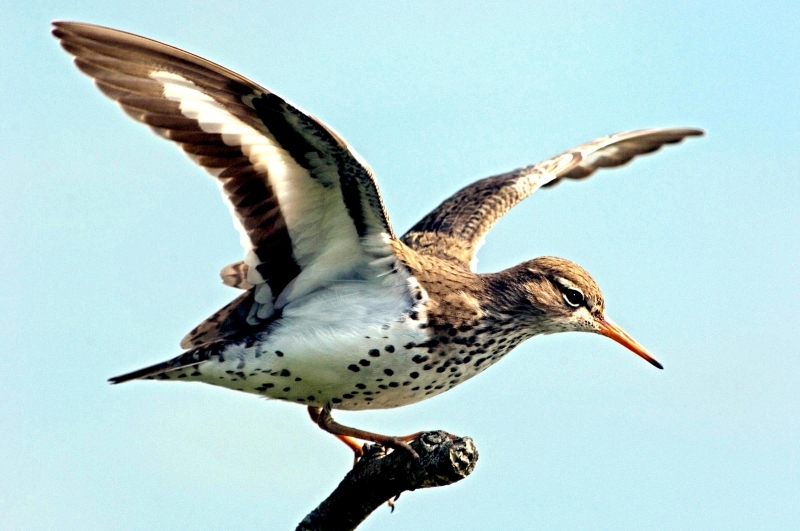 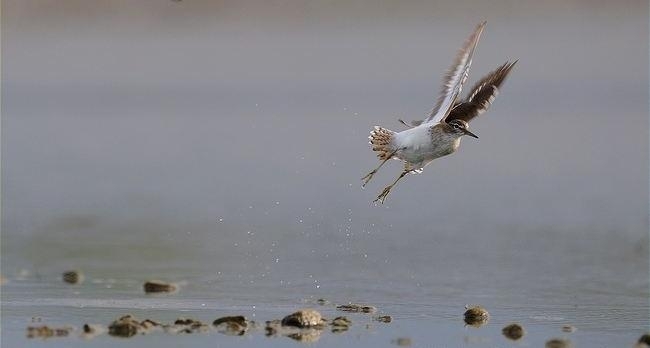 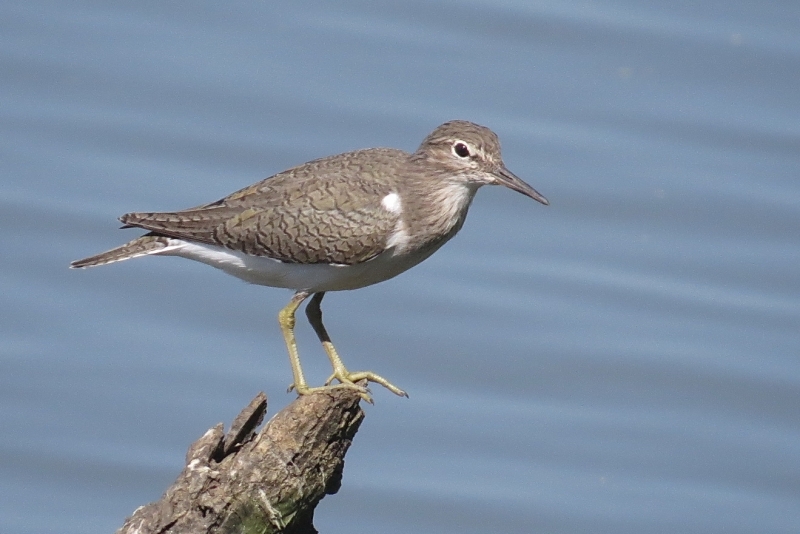 The calls of the Common Sandpiper include a shrill, three-note twee-see-see, given when the bird takes off, while the song is a high, rapid titti-weeti, titti-weeti. 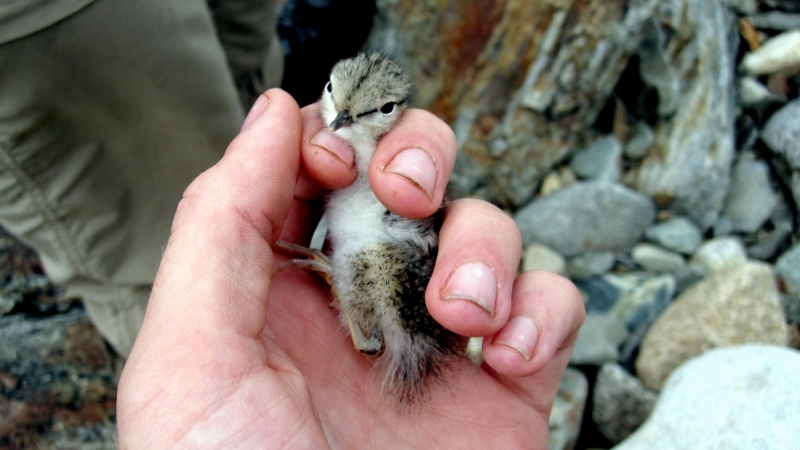 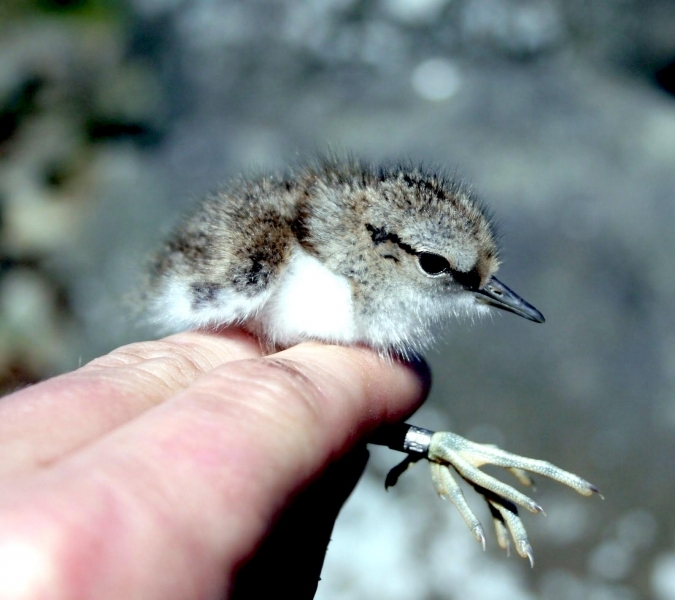 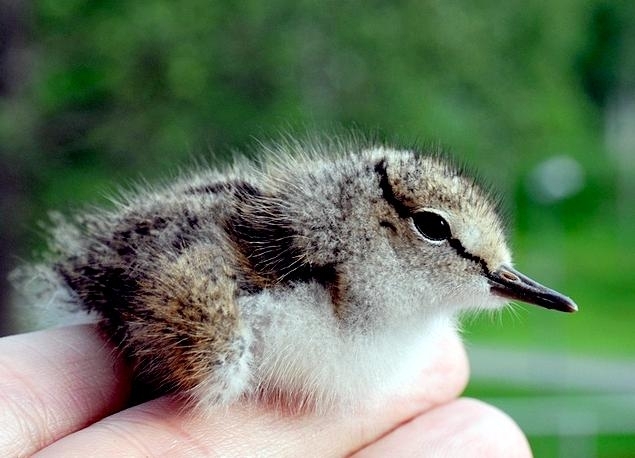 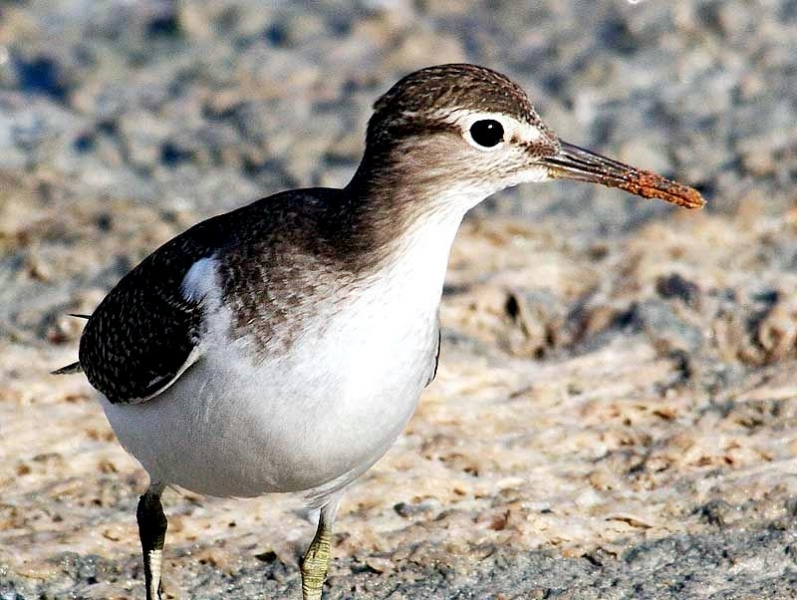 The breeding range of the Common Sandpiper extends from Europe, east across central Asia, to Kamchatka and Sakhalin, Russia and Japan. 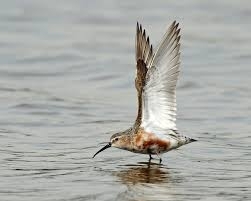 A migratory species, its winter range extends from Western Europe and Africa, through the Middle East and South Asia, to Indonesia and Australia. 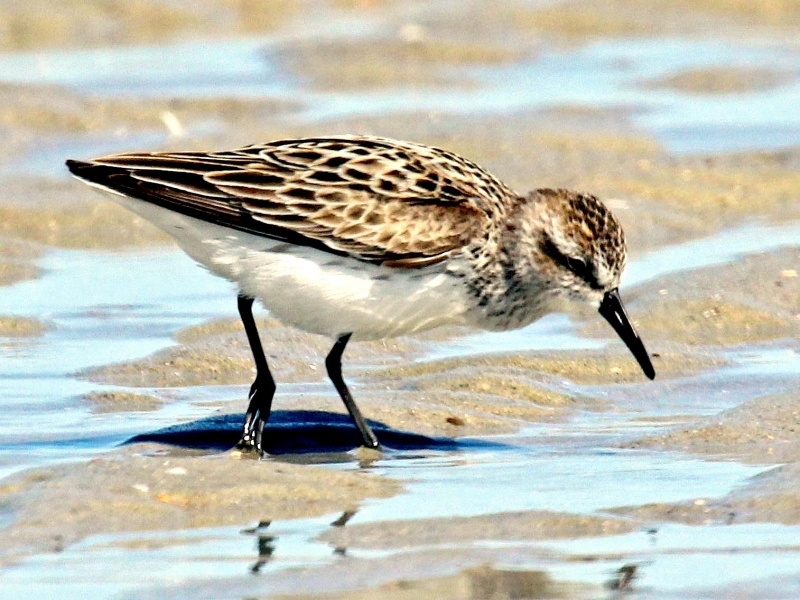 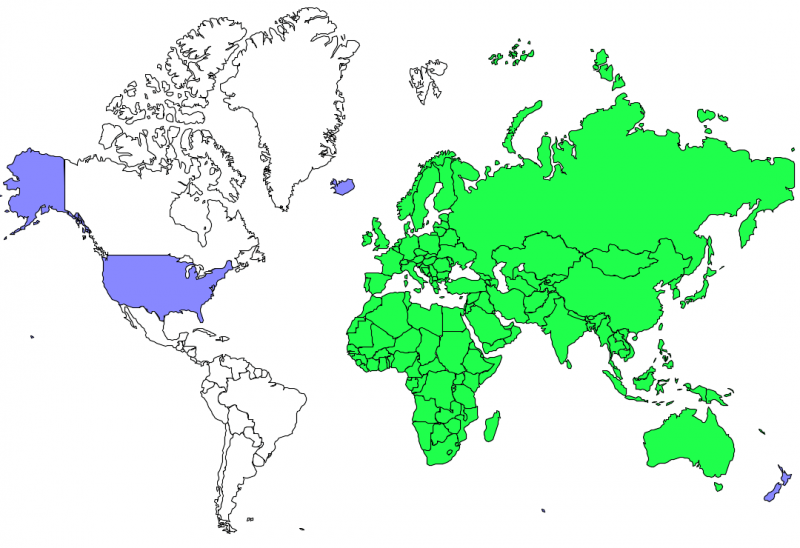 Individuals are also occasionally recorded outside the normal range for example in the United States, Iceland, New Zealand and on Western Pacific islands. 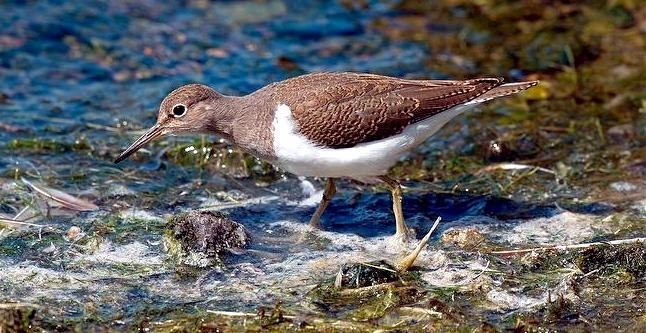 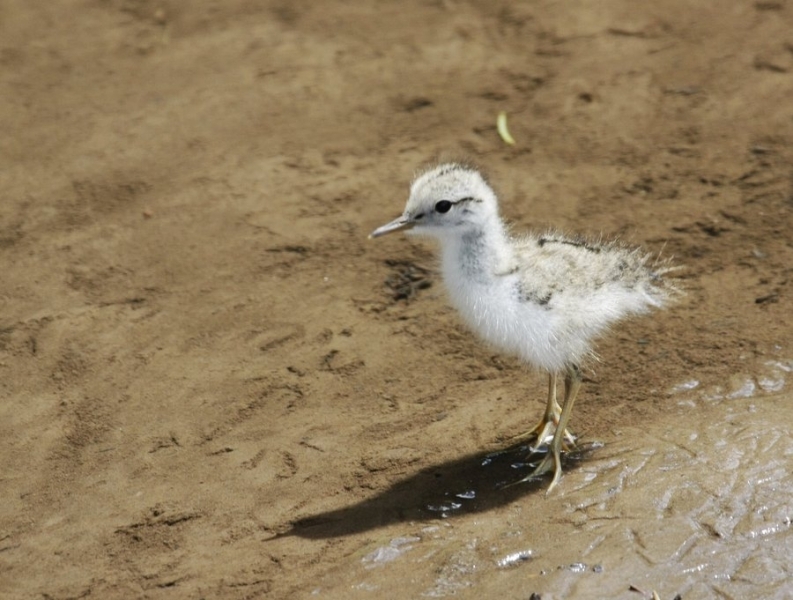 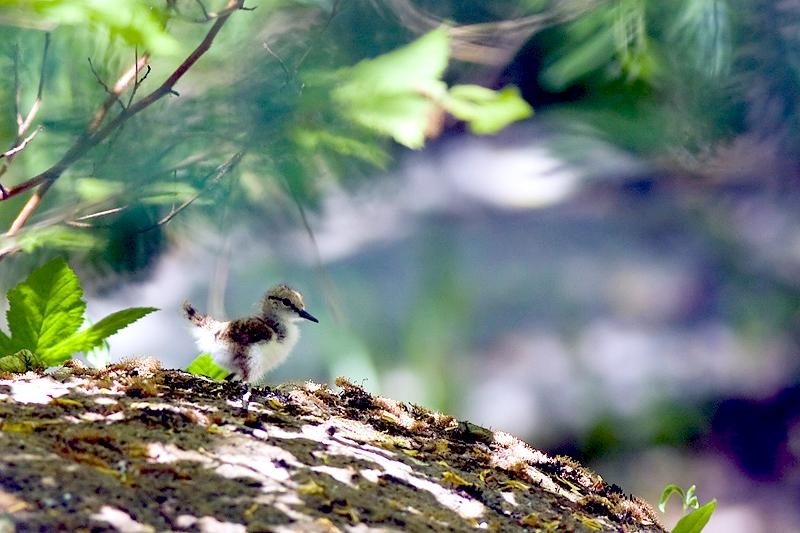 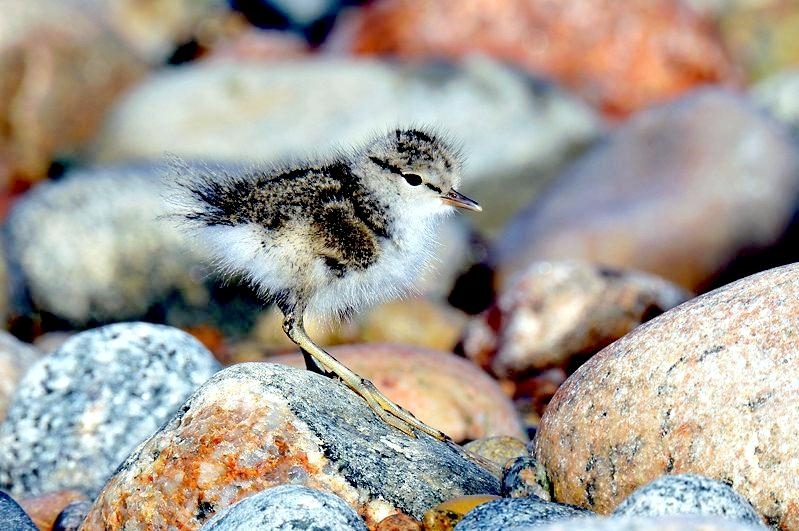 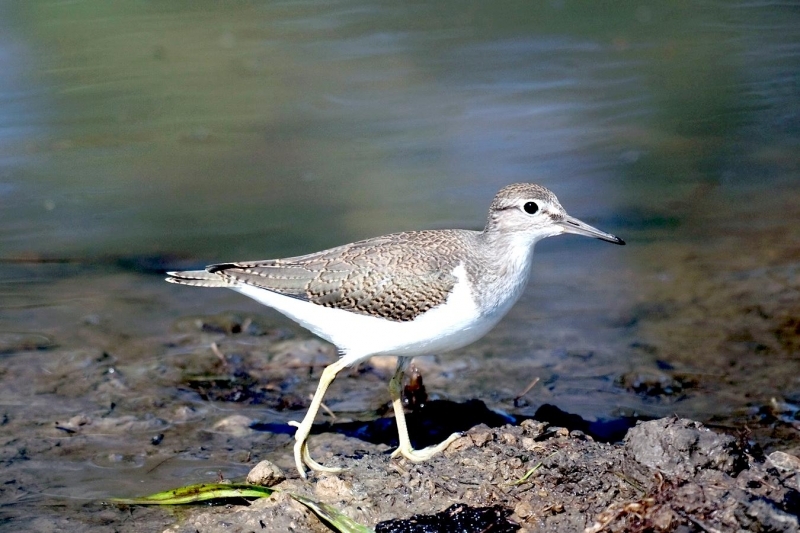 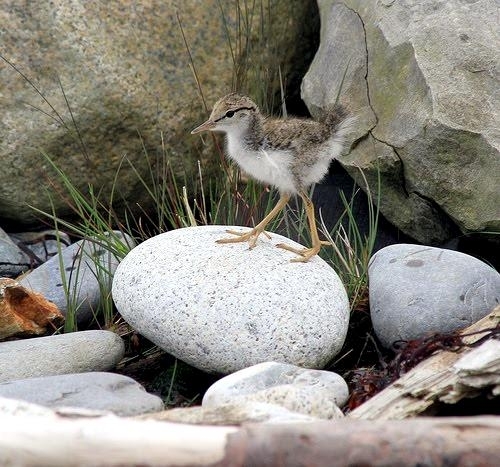 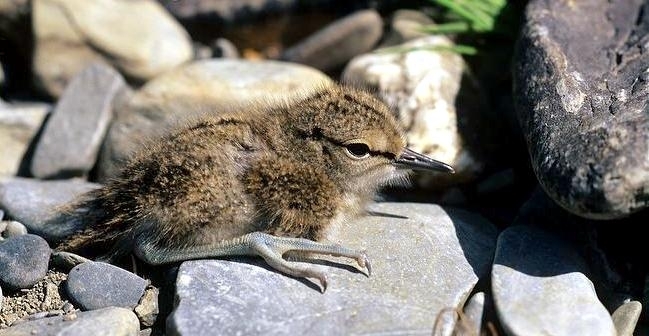 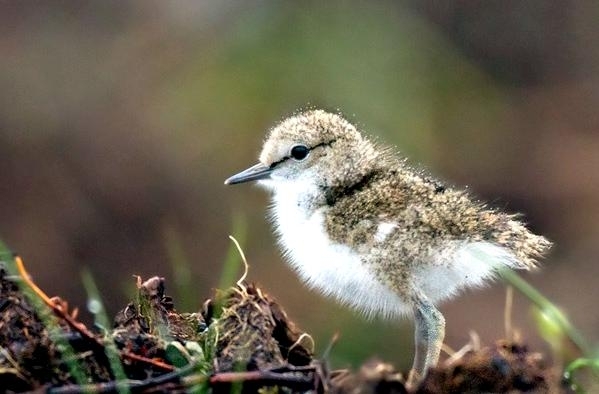 During the breeding season, the Common Sandpiper inhabits the edges of water bodies, particularly the pebbly, sandy or rocky margins of rivers as well as ponds, pools, lake shores, dams, estuaries and sheltered ocean coasts. 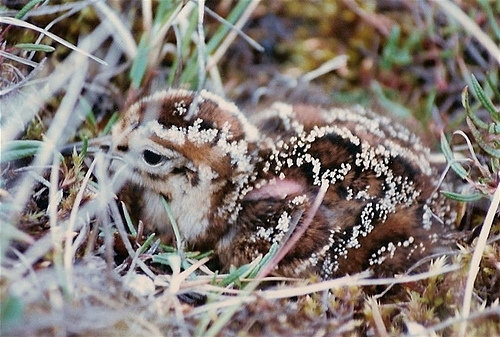 Foraging often takes place in grassland and dry meadows. 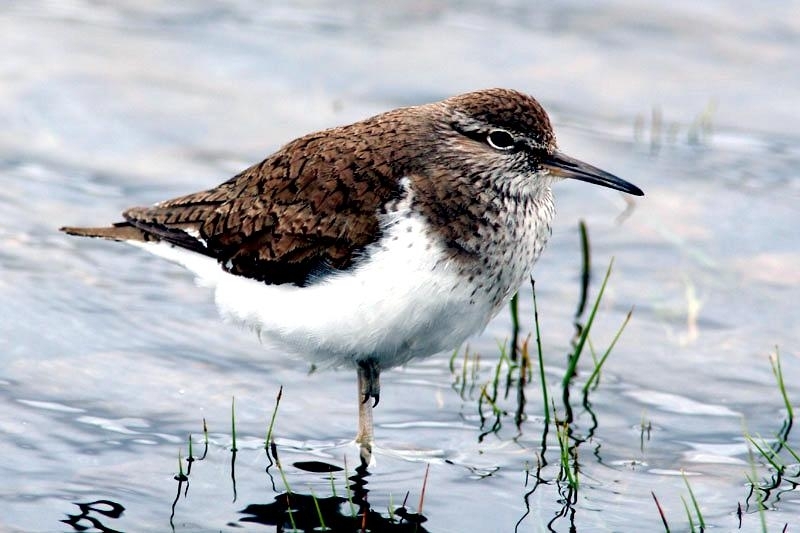 In its winter range, the Common Sandpiper occurs in a wide variety of habitats from coastal shores, estuaries and salt marshes, to inland wetlands, riverbanks, pools and even sewage works. 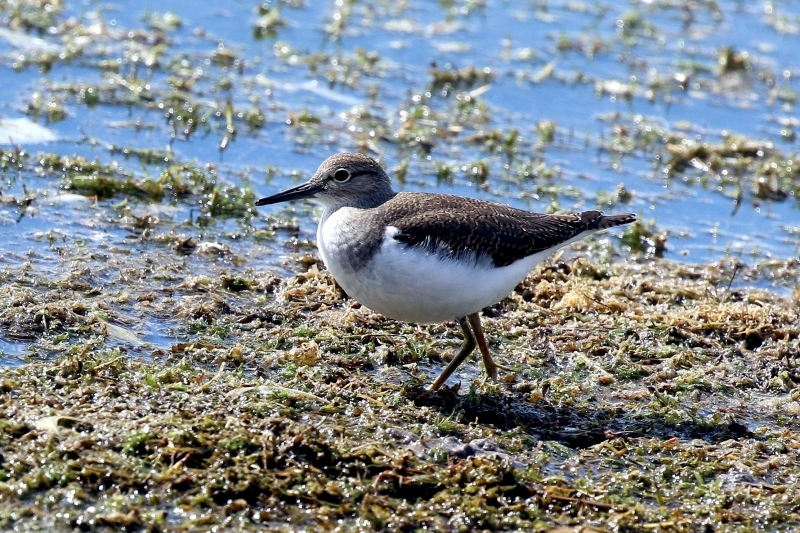 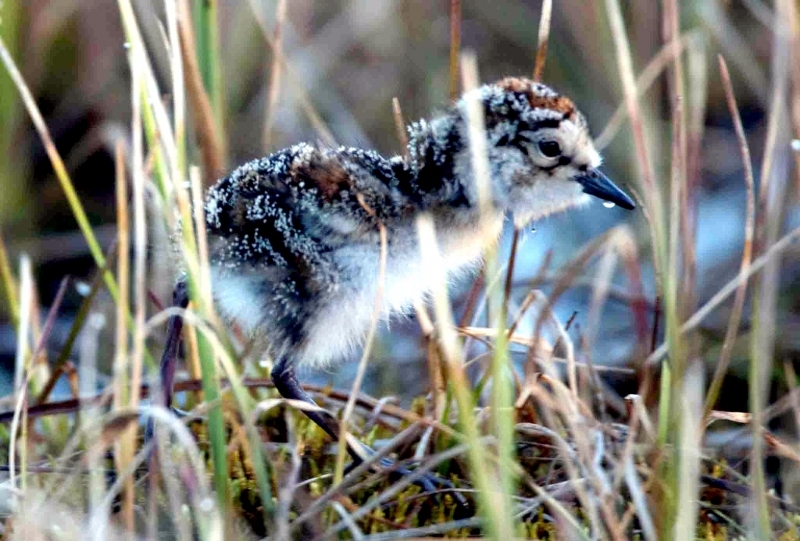 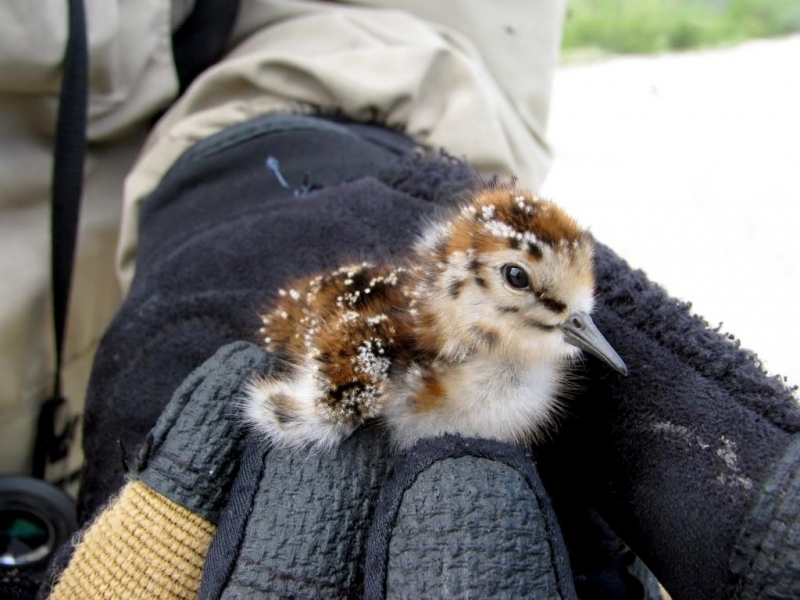 It will also forage in grassland along roadsides and in urban areas, but generally avoids large coastal mudflats as well as frozen, snow-covered or very hot areas.